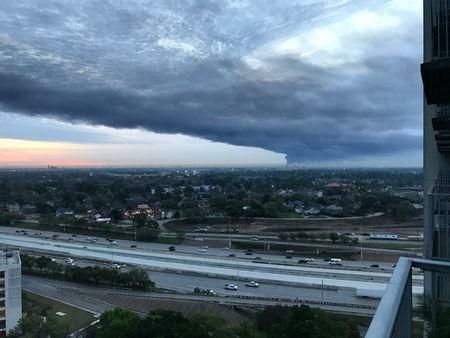 HOUSTON (Reuters) - A petrochemical fire was quickly put out after it had re-ignited Friday at a fuel storage facility outside Houston, which had compounded the danger from a containment wall breach earlier in the day that spilled chemicals and halted ship traffic in the nation's busiest oil port. Samuelsen could not say how much chemicals and water were leaking from the breach. The barrier held back water, chemicals and foam from an area where firefighters poured up to 20,000 gallons (75,700 liters) of water and foam a minute during the three-day blaze that destroyed the huge tanks.